My approach to Wilde’s most famous play is from a literary perspective, as anyone would expect who knows I have devoted not just one blog article but a second blog article entirely to the word Earnest. There is a reason for this which we will reach anon. Meanwhile, and purely from a literary point of view, the evening was a huge disappointment. Everyone agreed. 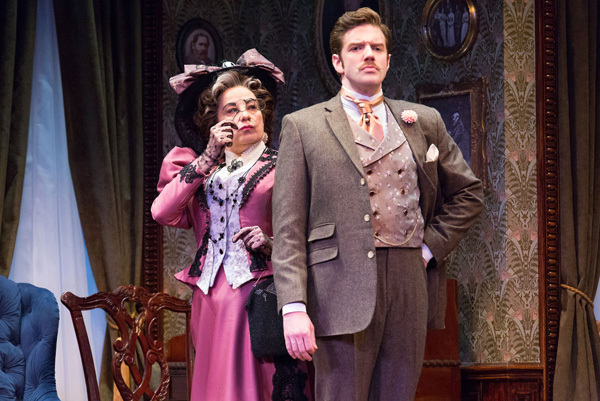 Even Lady Bracknell could have been referring to the production rather than the debonair Algernon when she described him as looking everything but having nothing. We may well have been in the oldest continuously operating theatre in the English-speaking world but that’s no reason for its spoken English to be hand-me-downs from the ghosts of clichés past. As Lady Bracknell adds: “being considerably advanced in years is no guarantee of respectability nowadays”. And there’s the rub. The timeworn triumph of entertainment over art. Long before H.L. Mencken encapsulated the thought, no one ever lost money by underestimating the intelligence of the great masses. With Earnest this notion expresses itself in producers too readily seduced by Wilde’s subtitle allusion to triviality into thinking that the play itself is trivial—conveniently overlooking Wilde’s injunction that it is a play for serious people. This invariably results in pure farce. And one should never speak disrespectfully of Earnest by calling it farce; only people who can’t understand it do that. Besides, it tends to compound irony if one treats superficially a play that mocks surfaces. Occasionally we find a director who may be in sympathy with the textual Wilde, but who fails to bring out the satire believing that the time-honored brilliance of the words will carry themselves. Such, I suspect, was the case with this production, where a British director with a good track record failed to handle the delivery of the language. Instead he concentrated on the physical direction of the piece—with variable results. Lady Bracknell, too, was given good stage direction. Her speech In Act I when leaving with Algernon to discuss songs for her programme was integrated into the action nicely, and made the more comic by her continually returning from the wings to opine misgivings about French and German music. Also, her circumnavigation of Jack armed with a lorgnette may be regarded as good fortune for the audience; and to repeat the device with a similar perusal of Cecily looked like carefulness. Both scenes, despite being a little labored, added to character. Character, too, was developed in the often minor role of Merriman who was kept amusingly overworked with luggage, and I would have liked to have seen this idea exploited more. Less successful was the scene in which Algernon and Jack are discussing what hard work it is doing nothing. To demonstrate this the director draws upon our patience by draping the actors motionless at opposite sides of the stage in silence literally doing nothing. All this achieves is to transfer the hard work of doing nothing to the audience. Not only was the moment tedious, it betrayed a misreading of Wilde’s intention. The joke is not that the over-privileged physically do nothing; the point is that they actually achieve nothing; or, as Algy puts it: “where there is no definite object of any kind”. All this is a shame for Daniel Fredrick as I did so like him in Mickle Street when he played the youthful Oscar meeting Walt Whitman. But his Algernon evinced an irritating manner not seen since Tom Hulce was a lad. And while it may have been appropriate for Hulce to have played Mozart as an obnoxious prodigy, Wilde gives Algernon “great truths” to ponder, witty remarks to say, and a subversive lifestyle to live. He should be played as a cynic not as a perky, posturing, fresh-faced refugee from the Drones Club. Consequently, the actor misses most opportunities to impart humor by misplacing inflexion. He even throws off his own timing. For instance, his line “now that I look at the inscription inside” when handling Jack’s cigarette case is delivered BEFORE he actually opens it. All this could be forgiven as the consequence of a misunderstanding between the play and a young person. And, in mitigation, there are jejune moments of exaggeration to be had as the play has elements of incongruity, buffoonery and mistaken identity. But what happens in the hands of the ham-fisted is that these tropes become an excuse to subsume any depth of character into the supposedly-acceptable pseudo-playing of the stereotypical upper-class twit which when laid on with a trowel the intellectual Anglophile finds condescendingly embarrassing. The most egregious instance of this is the handling of Wilde’s vignette of the cash-poor aristocrat being served bills he cannot pay on a silver salver by his subservient butler—followed by the sherry. If the theatre has an artistic director, which seems problematic, such a person needs to know this is Irony, and there’s more to its transatlantic treatment than callow pandering to PBS viewers like you with Downton Abbey sets and Bertie Wooster caricatures. Thus, our Algy, rather than giving us a stylized line in supercilious disdain as he discards the demands of the commercial classes, instead leaps about with arm-waving, eye-popping, over-reactions straight out of Tex Avery. If this were Earnest—The Cartoon it might be great pantomime, but the scene calls for social commentary not second-rate comedy. Then take Miss Prism. Please. Owing to her incomprehensible muttering at the start of Act II the play was fully thirty seconds into the dialogue before I realized it had restarted. Inattention to scene setting dialogue is one thing—merely a lack of technique and stage presence. More monstrous is when key moments are also treated like marginalia. Cecily. And was your novel ever published? At this nexus in the play we assume it was the foundling Jack who had been abandoned and the manuscript that had been lost—the dramatic irony being that only Miss Prism knows it was the other way around. We have yet to learn it was the baby that had been lost in a moment of confusion with the said manuscript which, in turn, had been abandoned only in the sense of discontinued. 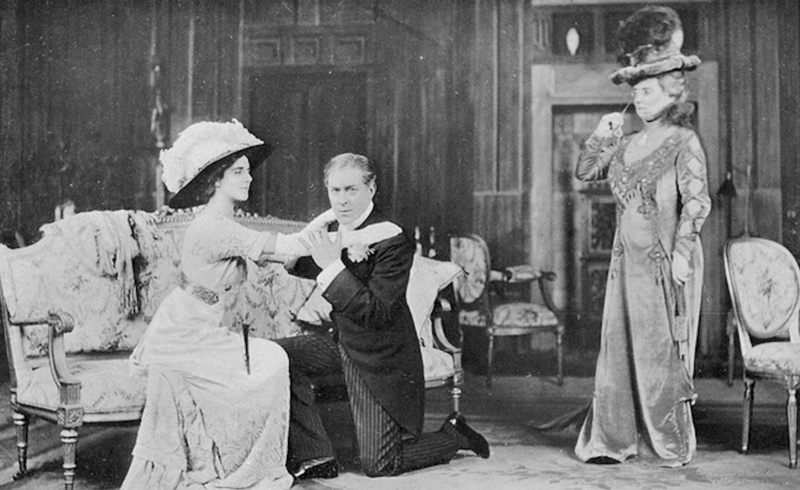 Miss Prism’s Freudian slip betrays her guilty conscience, which Wilde develops with the stage direction of Cecily’s reaction to the word, and Prism’s awkward explanation and subsequent desire to change the subject. Unfortunately, none of this is projected to the audience. In delivering their lines, the actors treat the exchange no differently from the preceding, but frivolous, dialogue by scampering through the lines as if trying to finish the evening’s performance in less time that the matineé. Of course, it is right that Miss Prism (the character) should wish to be peremptory in resuming her tutelage. But Miss Prism (the actor) should not be concerned with the McGuffin of Cecily’s lessons. She is there to add meaning to the text and direct the audience towards the denouement by measured reading. There is hardly a meaningful pause for emphasis that I can recall; indeed, the entire play felt rushed. Then there is the whole question of womanthrope. 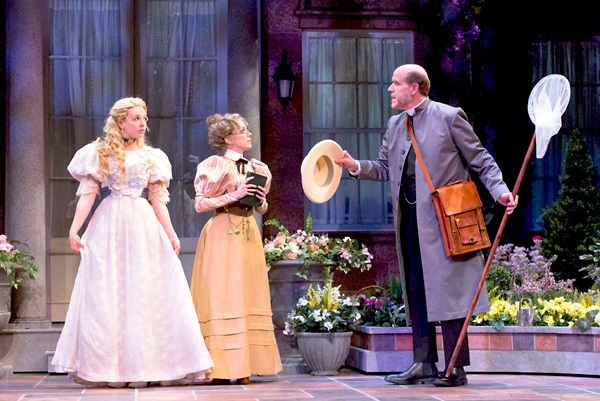 It is not one of the play’s more celebrated jests, and, indeed, the coinage (from the word misanthrope) is not original to Wilde  —although his linguistic idea is an appropriate usage for the bookish Miss Prism. Prism (the character) is an erstwhile writer of three-volume novels who evidently believes herself to be a Miss in name only. So she employs the womanly wordplay to differentiate the spinster from the ingenue in a romantic appeal to the mature Chasuble, whose church has not allowed him to marry. Once again Prism (the actor) tramples nervously over Wilde’s neologism sotto-voce and all significance is lost. During the intermission I asked several friends around me if they had picked up on the womanthrope joke and nobody had. To have forgotten this minor mot over time is understandable. But not even to recognize it five minutes after it has been performed on stage in front you is a sad indictment. 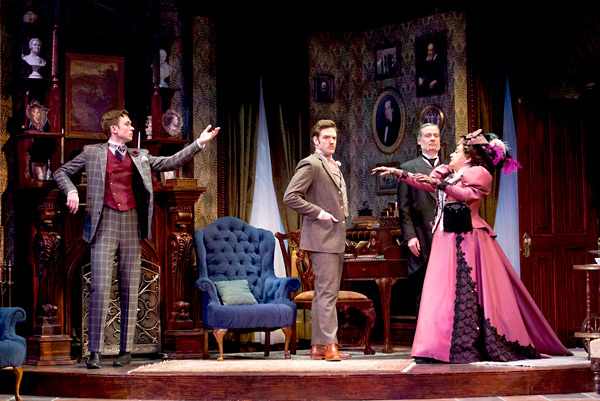 When a play goes well, for instance with Peter Hall‘s production of Wilde’s An Ideal Husband at the Haymarket in 1990s, it can seem effortless. The fact that the Walnut Street Theatre’s production fell short of this standard is not the point, for it is too easy to criticize. If I have it is only the foundation for a critique upon which to be constructive. My contention being that in a whole greater than the sum of its parts, some of its parts are greater than the whole. By this I mean that the best sets, lighting, costumes, and cast count for naught if, at its heart, a production does not connect the author with the audience by realizing the play’s intention on the stage. This requires a director who understands the author—and with Wilde, possibly more than most authors, this can mean understanding his biography, his era, his society, and his use of language. It requires effectively translating that understanding to the actors. And it requires actors with the skill and experience to transfer meaning to the audience. At the Walnut this connection was lost from the start. The director occasionally stood between the author and the actors; and the actors often stood between the audience and the lines. So what is the solution? In short, fewer practitioners and more poets. As this article in today’s Guardian informs us, straight plays are failing on Broadway while musicals continue to boom. Is this merely the triumph of entertainment over art, or has modern stage drama morphed from a collaborative to a cooperative? Film has its auteur, and music its maestro. So perhaps we need a return to the theatre’s Renaissance roots and the role of the actor-manager. I am talking about stylists from George Jolly and David Garrick through to Henry Irving. Indeed one of the last in the genre was George Alexander, who, in 1895 staged the first Earnest, and played the first John Worthing. What would we not give for producers to allow someone with the artistry of the actor-manager like Alexander who can not only concentrate on whether he is Ernest who was actually John before being Jack who was actually Ernest, but can also remind some of us for the first time his vital importance of his being George. The Rivals, by Richard Brinsley Sheridan (1812). Frankel cites an example from 1863, but this one is ten years earlier. Essay: “Reception and performance history of Wilde’s society plays”. Oscar Wilde In Context, Kerry Powell, Peter Raby, Eds. Cambridge University Press (2013). * Production Images © Mark Garvin. | Video posted by the Walnut Street Theatre. I sat in the same audience and feel the same. Perhaps if concealing the artist is art’s aim, Mr Carlton’s direction was successful in that he managed to hide the Wilde of being Earnest. Great review! Nice thought. But for completeness what Wilde said in Dorian Gray was: “To reveal art and conceal the artist is art’s aim.” And my (our) point is that the art lay concealed too.